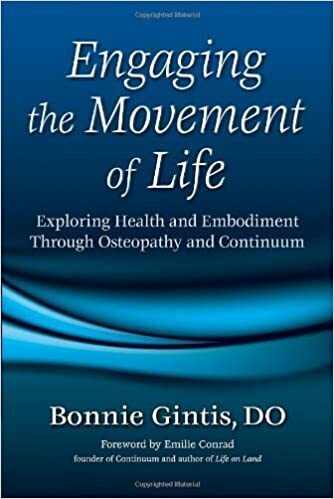 Praise for Engaging the Movement of Life “Engaging the Movement of Life offers a revolution of thought and purpose in the exploration of embodied health. Our fragmented understanding of the human body dissolves in Bonnie Gintis’s much broader view of our biological intelligence. This book could not be more timely in providing us with a guide for health in the twenty-first century.” — Emilie Conrad, founder of Continuum and author of Life on Land “With accessible, evocative writing Bonnie Gintis interweaves the potent discoveries of Continuum and Osteopathy to reveal complex truths about the nature of life, health, the fluid dynamics of creation, and especially how we can creatively participate with them. Full of insights and practices, Engaging the Movement of Life is a radiantly clear and sensuous call to deepen our embodiment, daring us to inquire with innovative attention as we engage life.” — Susan Harper, international teacher of Continuum Movement and creator of Em’oceans and Sensations Trainings “Bonnie Gintis straddles the seemingly different worlds of intuitive body truths and information from the scientific point of view. She provides tools and suggests ways of looking, feeling, knowing, and thinking that are the currency of those of us involved in the world of the body. Gintis’s message that everything is interdependent and mutable is a ray of both hope and clarity. With Continuum as the medium, she gives us both the permission and the keys to begin a lifelong journey of independent exploration of our bodies.” —David Brown, founder of BodyRecoding, a Pilates/Gyrotonic studio In Engaging the Movement of Life, Bonnie Gintis offers Osteopaths a special opportunity to experience Osteopathic principles at work within ourselves rather than just within others. This is a rare guide toward our own personal development, from within.” —Nicholas Handoll, DO, MSCC, author of Anatomy of Potency.